The heritage of developing nuclear weapons in the United States remains with us, as the recent discovery of a jar of plutonium — historic but still deadly — found at the bottom of a waste pit suggests. We asked Max S. Power to guide us through the tortured history and future of defense nuclear waste. Part Two outlines key issues that need to be addressed by all sides in cleaning up defense nuclear sites. Part Three will illustrate how openness, accountability and trust can lead to effective actions to reduce present and future risks. Decades of rushed and largely secretive production of plutonium and enriched uranium for nuclear weapons left immense legacies of contamination and toxic wastes in the United States. From the Manhattan Project onward, the arms race created significant cleanup challenges at more than 100 locations, some covering hundreds of square miles. A Resources for the Future study estimates the legacy includes 75 million cubic meters of contaminated soil, enough to cover the entire island of Manhattan more than 5 feet deep, and 1.8 billion cubic meters of contaminated groundwater (filling a Manhattan-sized reservoir 135 feet deep). Toxic materials and wastes deposited in the environment by nuclear materials production include radioisotopes such as plutonium 239, with a half-life of 24,000 years, large amounts of organic compounds like carbon tetrachloride and metals such as lead, cadmium, chromium, beryllium and mercury. 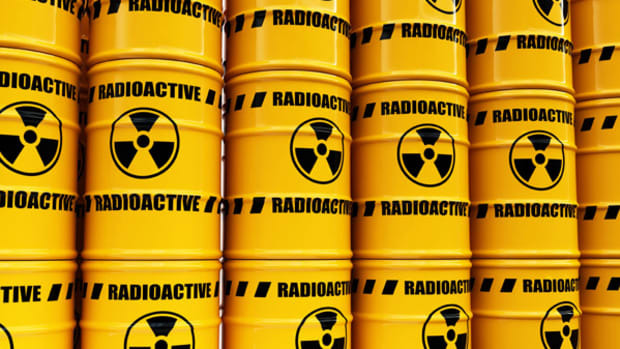 The Department of Energy, which inherited the nuclear weapons production complex, must store, treat and dispose of more than 160,000 cubic meters of solid radioactive and hazardous waste and more than 100 million gallons of liquid, high-level radioactive waste. Add to these more than 2,300 metric tons of spent nuclear fuel and at least 38 tons of separated plutonium 239 declared a surplus to the weapons stockpile. In 2000, the Energy Department estimated that cleaning up the nuclear weapons production complex would cost $212 billion and take 70 years. Even so, long-term monitoring and maintenance of contaminants left in place would be needed at 109 sites across the country. In 2002, the Bush administration proposed reducing the time required by 35 years and the cost by $50 billion. Neither estimate is precise; at this point, it looks as if the outcome will be somewhere nearer the 2000 estimate. The cost is less than 4 percent of the total cost of the U.S. nuclear weapons program, based on a 1998 Brookings Institution study. "Cleanup" in this case primarily means isolating the contaminants from the environment either by solidifying and placing them in engineered near-surface or deep geologic disposal cells, or confining them in situ. Many people are overwhelmed by the immensity of the problem and its highly technical nature, so they presume it&apos;s best left to the experts. • How clean is clean? What is a safe (or reasonable) level of risk to be left when cleanup is done, and who has the authority to say so? • Should the contamination be removed or left in place? What are the trade-offs between short-term risk to workers and costs to the taxpayer if contamination is retrieved and redisposed versus long-term risks and costs passed on to future generations if the contaminants are left in place? • If wastes are to be moved, then to (and through) whose backyard? Who has a say, and how, in decisions about locating disposal facilities and picking transport routes? The ongoing tussle over dumping waste at Nevada&apos;s Yucca Mountain provides a telling example. Second, given the history of nuclear activities, technical experts alone cannot achieve sufficient political momentum to reach sustainable solutions. The beginning of the nuclear age in 1945 and the Cold War fostered images that evoke strong, visceral public emotion, or "affect." During the 1970s and 1980s, nuclear accidents like that at Chernobyl, a series of controversies about selecting sites for nuclear waste disposal facilities and media revelations about risky situations at defense nuclear sites diminished public trust in nuclear experts. As a result, concerned lay people elevated cleanup of nuclear sites on the agenda of both Congress and state governments. Many believed that embarking on new nuclear projects while not addressing the legacy of waste and contamination was unthinkable. People who had been outside the closed, self-regulating world of nuclear defense production demanded recognition of their concerns. They pressed state and federal legislatures and agencies to act, used statewide initiatives to mobilize concerned citizens and pursued legal remedies. In many cases, these actions forced greater attention to, and openness about, releases of radioactive and hazardous contaminants to groundwater and the air. For example, "expert" views that plutonium would not travel through soil or that leaked tank waste could not reach groundwater outside the nuclear production complex at Hanford, Wash., were disproved. Armed with such information, activists and state and tribal officials often opposed new nuclear projects. In some cases, they also challenged proposed cleanup activities — e.g., so-called "near-surface disposal" of cemented Hanford tank waste in south-central Washington. Meanwhile, the nuclear experts — especially those working for the Energy Department and its contractors — often were convinced that this mistrust, opposition and interference reflects emotion and misinformation, not scientific "fact." Their disdain for and dismissal of often deeply felt public concerns tended to increase mistrust and opposition. For example, the department has often failed to address public concerns about transport of nuclear waste in a way that increases understanding rather than fear and opposition. A majority of these experts failed to grasp a point made nearly a century ago by W.I. Thomas — that "what man defines to be real is real in its consequences." The "emotional" and "misinformed" quality of significant public opposition is primarily rooted in two perceptions of risk. First, radiation is perceived as an unseen threat to health. One can be exposed to enough to cause harm without ever seeing, tasting, smelling or touching it. Moreover, its effects may be latent, turning up only decades after an exposure. People, therefore, dread this unseen menace. Second, except for individual medical tests and treatments, people&apos;s exposures to radiation risks are involuntary. For example, families who moved into semi-rural Washington state homes near a plant identified only as "Feed Materials" on its signs did not anticipate significant uranium contamination in their wells. For 40 years, nuclear weapons production facilities were shrouded in secrecy and surrounding communities were provided little information about potentially hazardous releases of radiation and chemicals to the environment. The belief that the government&apos;s nuclear establishment had failed to inform people about the risks imposed further eroded trust in the experts. The issue is cast in technical jargon and subjective judgments," summed up Viron P. Vaky, a former assistant secretary of state (and former ambassador to three Latin American countries). "Indeed, a major difficulty is precisely that the nuclear question is so caught up in a swirl of charge and counter-charge, affirmation and counter-affirmation, advocates of different views have such a penchant for stating things their way, that it is difficult for the average person even to identify what the points at issue really are. And so people are generally left frustrated, confused and anxious."